In the wake of re-organization of the state of Andhra Pradesh, new TINS with appropriate state codes have to be issued to all VAT dealers. The respective state codes are decided by the Government of India and will be made known to all soon. To facilitate the process of issuing TINs to dealers, an online form has been designed to seek the dealer’s option for continuing Registration in the state(s) of their choice. This online option form is available in the dealer login and will pop up once a dealer logs in to file his return/ take statutory forms etc. The Department advises you to fill the online option form at the earliest. Dealer has to choose relevant option depending on the scenario i.e. 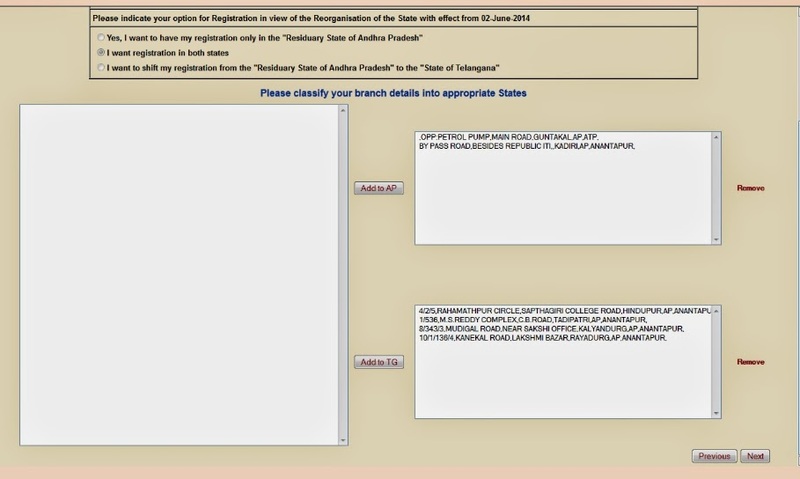 can choose to continue only in the Residuary State of AP, can choose to continue only in Telangana, can choose to have Registration in both the states, can choose to shift entire Registration from one state to another. Please see power point presentation at the following link for detailed steps for each scenario. Once the dealer clicks on “submit” button, he/she cannot go back and edit the data. So the dealers are requested to exercise due caution while filling the form and submitting the data. Once a dealer submits an option form, he/she can print an acknowledgement and file it for record. Once all option forms from dealers are received, TINS will be generated as a batch process. The TIN generated with the changed state code will be notified well in advance to the dealer online or through e-mail as per the timelines given below. VAT Registration Certificates will be issued by the concerned Registration Authority on/after 02- June-2014. The dealers are requested to collect the RCS from their respective Circle Offices. For any clarification, query regarding the Issue of TINs, please write to ctd_helpdesk@apct.gov.in or vatis_helpdesk2@apct.gov.in. We will be glad to assist you! 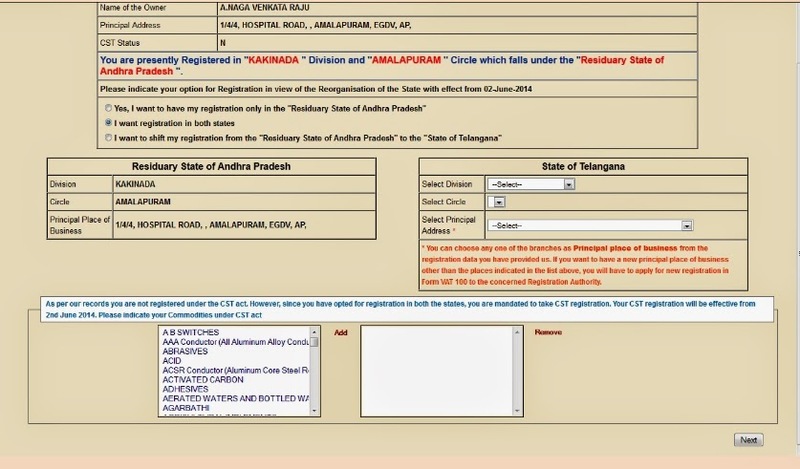 For dealers of the Residuary State of Andhra Pradesh with no branches in Telangana, seeking a Registration only in the Residuary State of Andhra Pradesh. For dealers of Telangana with no branches in the Residuary State of Andhra , seeking a Registration only in the State of Telangana. For dealers seeking registration in both the states i.e. 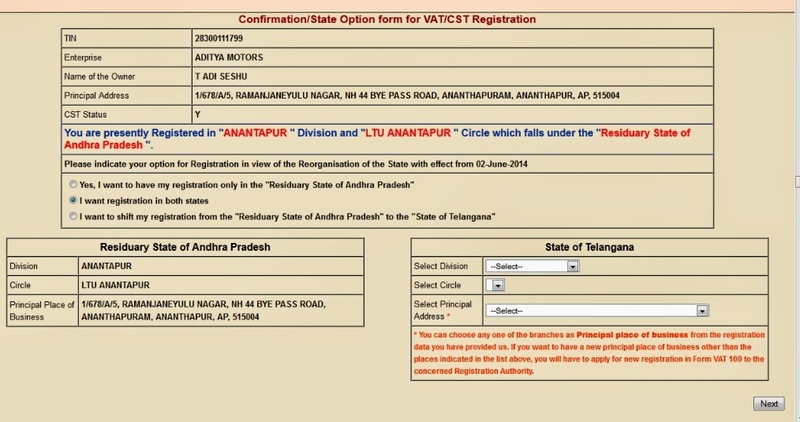 Telangana and Residuary State of AP and also opting for CST registration. By giving prior guidelines to the dealers, they will be given an option from 15/04/2014 of continuing their registration in the State of their choice. As of now, the existing provisions of the APVAT Act, 2005 will apply to both States unitl further change, as per Section 100 A.P. Reorganisation Act, 2014. The present guidelines for issuing C Forms will continue in future also. There is no change inthis process as to issue or time limits. Is it possible, if any enhanced purchasing power of Andhra Government to give selling opportunity to Telangana Govt. If goods under transport are not accompanied by a valid way bill, such transport of goods is liable for penal action, including colleciton of tax. Non uploading of previously obtained waybill utilisation. For obtainting "C" Forms, the said commodities intended to be purchased, shall have been got included in the CST Certificate of Registration - may contact the Registering Authority. If the purchases from outside the State and their transport without "Advance Waybills" were not checked at checkposts, the requirement is account for them in books of accounts of the purchasing dealer. For violation of statutory provisions, penalty can be levied. Depending on which State, you have your VAT registration, your new TIN will be given. Hence a new series of invoices shall be issues with a new TIN. Treatment of goods rejected are to be handled by filing revised VAT 213 returns. Anyway, specific instances will be addressed to the assesing authority with all documentary proof enclosed. When GST will be implemented. How the input tax credit will be refunded. The Government of India and the Empowered Committee of State Finance Ministers have not yet taken any decision as to the modalities of GST and its implementation. Reimbursement of VAT paid will be made by Industries Department. Hence, dealers may be advised to approach the Industries Department for change of TIN in the Final Eligibility Certificate. How about the uploads and downloads of C forms F Forms and other forms of the state gets bifurcated? The existing procedure will continue without any change in formats except new TINs, even after State Bifurcation. 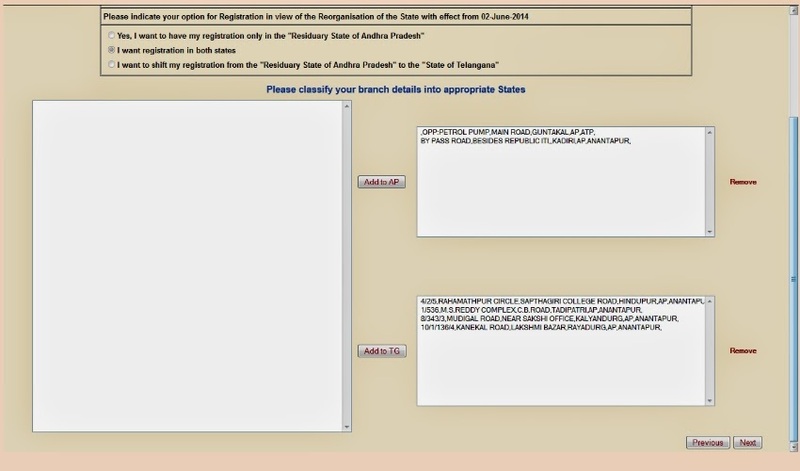 Premature closure of unit in Telangana (which is a violation of conditions of Final Eligibility Certificate) may dis-entitle the dealer to avial Deferment and may lead to cancellation of the Final Eligibility Certificate by the Industries Department and demand for payment of deferred amount by the Commercial Taxes Department. 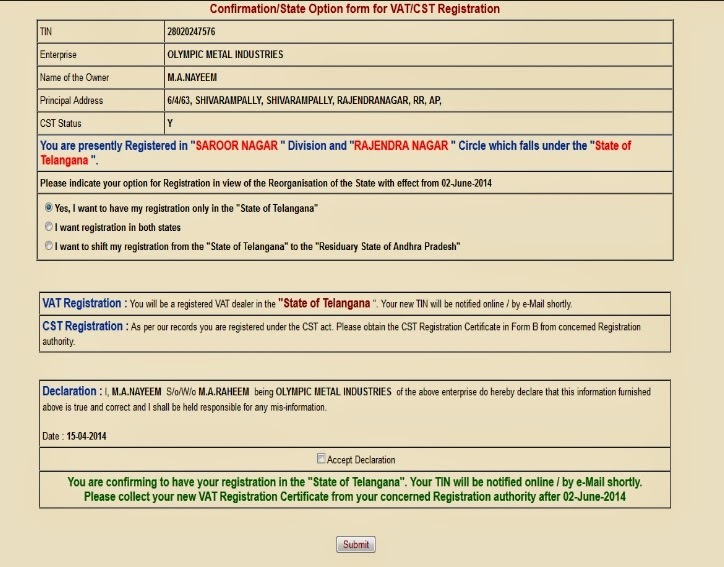 Every dealer in the State will be given an option Form on or after 15/04/2014 in which he wants to have his registration. Detaile guidelines will be issued in this regard shortly. VAT dealer in Telangana with HO in Mumbai opens a branch in AP. Request you to clarify - Whether again, Direct PAN Proof of address of non resident directions. 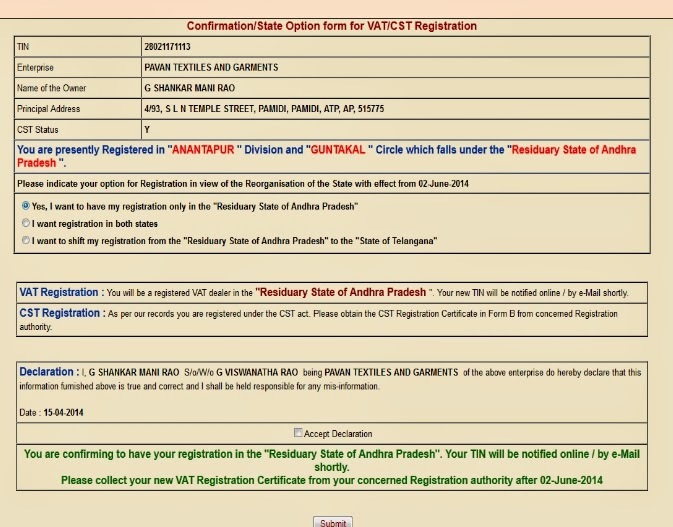 In the State of A.P., after bifurcation, a new TIN is to be obtained from the concerned Registering Authority, by filing fresh Form VAT 100 with all address / other proof. On or after 02/06/2014 (appointed day) any sales from the State of Telangana to any dealer / consumer in the State of Andhra Pradesh (vice - versa) will be treated as interstate sales and liable tobe dealt under CST Act; and with ITC under VAT Act. Industrial Incentives are location of industry specific. 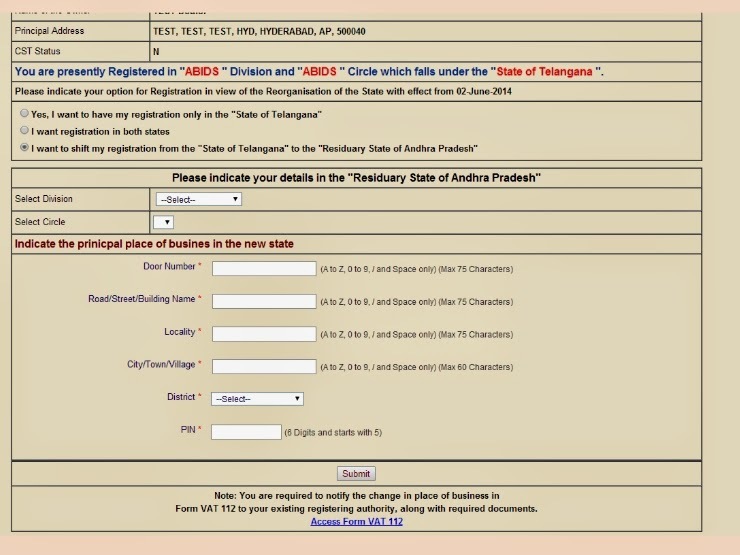 So, if the industrial unit is located in Telangana, then Telangana State will allow such industrial incentive if Final Eligibility Certificate is issued. If the industry is in Andhra Pradesh, then AP State will extend such incentives. Both States cannot give on the same location of industry. 1.Is there any entry Tax on transactions between the proposed two states. 2.Hyderabad being a common capital,the transaction from /to the two states.How the transactions are treated?VAT (or)CST? If the Goods are falling under A.P. Entry of Motor Vehicles into Local Areas Act, 1996; then Entry tax is leviable. Sales between a dealer in Telangana and a dealer in A.P (vice - versa) will be treated as interstate movement of goods and CST Act will apply, but not VAT Act. All sales, local or otherwise, require carrying waybills, unless the goods as such are exempt from tax. At the end of every year, during the monthlry return for March, the dealer having excess ITC shall have to exercise an option - whether to claim refund (or) to carry forward ITC. Depending upon such claim, either be refunded (or) allowed to carry forward in Telangana State. 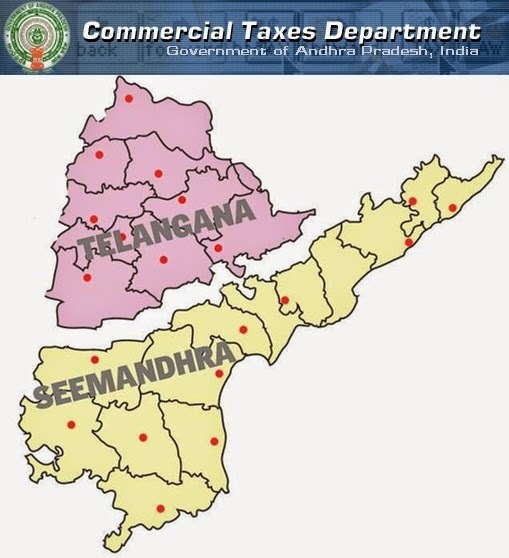 If the Profession Tax is already paid on or before 01/06/2014, thenit goes to the united State of Andhra Pradesh; if paid on or after 02/06/2014, then it shall go the State of Telangana. Let the concerned Association make a specific request to the Commissioner of Commercial Taxes to take further action. 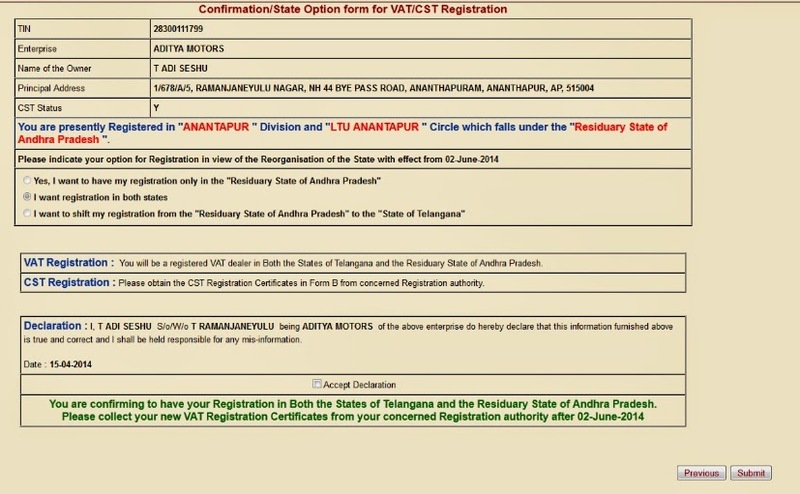 If you do not have registration in Andhra and you intend to do business in Andhra Pradesh, you will have to obtain VAT registration in the State of Andhra. Detailed guidelines will be issued in this regard soon. As per A.P. Reorganisation Act, 2014 (Sec.100), same statutory provisions will continue in both the States. 1.please issue new TIN by 15th May for smooth implementation. Steps are being taken to issue new TINs at the earliest (but effective from 02/06/2014). Delayed cases of refund may be brought to the notice of the Deputy Commissioner (CT), concerned or Commissioner (CT) for further action.